Uniquely among Wednesday’s broadcast network evening newscasts, ABC’s World News with Charles Gibson informed viewers that the Israeli navy earlier in the day intercepted a record quantity of weapons supplied by Iran and destined for Hezbollah, in violation of a United Nations resolution forbidding the arming of the Lebanon-based terrorist group. Host Gibson set up the report: "Israeli navy commandos today seized a ship off the coast of Cyprus. Israel's defense ministry says it was loaded with tons of weapons bound for Hezbollah militants in Lebanon. It is the largest cache of weapons ever interdicted by the Israelis, who say the arms came from one source: Iran." Correspondent Simon McGregor-Wood opened his report by relaying that the quantity of weapons seized was enough to "keep the Islamic radicals of Hezbollah fighting for a month." And as he concluded the report, he also gave credibility to the conservative view that Iran should not be trusted in negotiations over its nuclear program: "Today's interception won't substantially reduce Hezbollah's military power, but it strengthens Israel's warning to those trying to negotiate with Iran – including the U.S. – it can't be trusted." After President George W. Bush employed the words, "You’re either with us, or you’re with the terrorists," addressing a joint session of Congress in the aftermath of the 9/11 attacks – as the President prepared for the impending war in Afghanistan – liberals eventually treated those words with consternation as if the blunt declaration reflected poorly on America. But pro-democracy activists in Iran seem to like a similar message, as a group of protesters in Iran called on President Barack Obama to support their cause, chanting, "Obama, Obama, either you’re with them or you’re with us!" 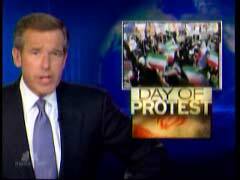 Uniquely among the broadcast network evening newscasts, NBC Nightly News correspondent Ali Arouzi – stationed in Tehran – showed a clip of anti-government demonstrators chanting their message to President Obama, as he translated their words into English. During a report that focused mainly on the government-orchestrated anti-America protest organized to commemorate the 30th anniversary of the Iranian Hostage Crisis, Arouzi also passed on the activities of anti-government activists: "On a day when anti-American sentiment runs high, the opposition was looking for support from President Obama, chanting, "Obama, Obama, either you're with them or you’re with us." Less than a week after likening conservative blogger Michelle Malkin to a “mashed-up bag of meat” on his Countdown show, MSNBC host Keith Olbermann on Monday called out former President George H.W. Bush for daring to call him and fellow MSNBC host Rachel Maddow “sick puppies,” as Olbermann described Bush’s words from a recent interview as a “weird term." As he characterized Bush as being hypocritical for making the comment while denouncing the incivility in American politics, Olbermann accused Bush of helping to create the climate of incivility himself in 1988 with the Willie Horton ad, although the ad Olbermann was referring to which showed a photograph of Horton – and which Olbermann displayed images of – was produced by an independent group, the National Security Political Action Committee. The Bush campaign never used Horton’s image, but instead ran the “Revolving Door” ad attacking Michael Dukakis’s support for a prison furlough program. After months of investigation, the Israeli Defense Forces (IDF) released a report addressing accusations from some humanitarian groups that its use of white phosphorus (WP) munitions in the Gaza War was a violation of international law, as the report distinguishes between the use of WP as a weapon and the more common non-weapon purposes such as providing smoke screens to conceal troop movements. The pro-Israel group CAMERA recently quoted from the report in the article, "Did Israel’s Use of White Phosphorus Constitute a War Crime?" by Steven Stotsky, on its Web site. The report not only argued that the military's decision to explode the munition in the air was safer for civilians than it would have been to explode it on the ground, but it also suggested that the use of WP to facilitate troops movements also meant civilian casualties were lower than they otherwise would have been by making attacks on Hamas more accurate. Last January, evening newscasts and some morning newscasts on the broadcast networks and on CNN and FNC reported on accusations from humanitarian groups – with varying degrees of accuracy – with CBS even referring to WP as a "banned weapon," and a "horrific new weapon, " and contending that the IDF may have committed "war crimes." At one point, CNN similarly incorrectly identified WP as a "banned substance." ABC showed a clip of a wounded Palestinian boy charging that Israelis have "no mercy" even for children. (MSNBC does not have a morning or evening newscast equivalent to NBC’s Today show or the NBC Nightly News, so MSNBC coverage was not examined.) But, according to a Nexis search, none of these news programs showed any interest in updating viewers once the Israeli military had made public its say on the matter. 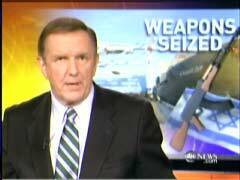 As previously documented by NewsBusters, the January 22 CBS Evening News ran a report (video here), introduced by anchor Katie Couric, which left the impression that the Israeli military had used a "banned weapon," without informing viewers that there are non-weapon uses for WP, and passed on accusations of "war crimes." Couric: "Hamas just ended a bloody war with Israel in Gaza, and tonight there is growing evidence the Israelis may have used a banned weapon. Some even accuse them of war crimes." On the January 25 World News Sunday on ABC, as he introduced a report by correspondent Simon McGregor-Wood, anchor Dan Harris played up complaints against "both sides" in the war, and even suggested that the Israeli side may have been worse in its conduct of the war as he highlighted that there was "especially tough criticism" leveled at Israel. Harris: "Both sides are being dogged now by complaints that they violated the rules of war. Israel has come under especially tough criticism for its use of a chemical agent." Monday’s Lou Dobbs Tonight on CNN gave attention to filmmaker Phelim McAleer – whose film Not Evil, Just Wrong premieres this Sunday and challenges Al Gore’s Inconvenient Truth – in the aftermath of his recent attempt to get Gore to respond to the British High Court ruling that there are nine factual errors in An Inconvenient Truth. But McAleer’s microphone was cut off as he tried to get Gore to answer for some of these inaccuracies and whether the former Vice President was trying to correct his mistakes. After a report by correspondent Casey Wian – who showed a clip of the exchange between McAleer and Gore, and who also mentioned some of the inaccurate points in An Inconvenient Truth about polar bears and Hurricane Katrina – Dobbs hosted a debate segment between McAleer and Fred Krupp of the Environmental Defense Fund. McAleer pointed out that many of the environmental scientists pushing global warming theory were pushing global cooling theory decades earlier: "And the same environmentalists who are now saying it is warming, 20 and 30 years ago were saying we're going to have an ice age. I'm old enough to be at school and I was told that we're going into a new ice age." All three broadcast network evening newscasts on Thursday informed viewers of President Obama’s trip to New Orleans – including criticism he received for only staying a few hours. 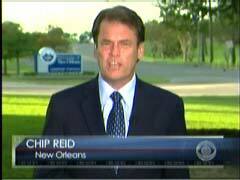 But correspondent Chip Reid of the CBS Evening News uniquely played up the fact that, even though President Obama had complained about President Bush’s handling of Hurricane Katrina rebuilding, the Obama administration is receiving some of the same complaints -- including from one man wearing a Barack Obama T-shirt. On the down side, Reid passed on Obama’s attempt to blame the Bush administration without including anyone to advocate on former President Bush’s behalf. The powerful chairman of the House Ways and Means Committee recently revised six years of financial disclosure statements, revealing more than $600,000 in previously unreported assets and tens of thousands of dollars in unreported income. 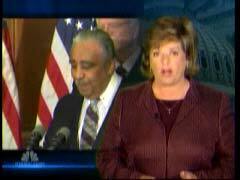 Among the holdings Rangel failed to report, an investment account and a checking account, each worth at least $250,000. Rangel also has admitted that he failed to report and pay taxes on $75,000 in rental income on this villa in the Dominican Republic. On Tuesday’s Countdown show, MSNBC’s Keith Olbermann spewed bile at conservative commentator Michelle Malkin, accusing her of possessing "fascistic hatred," and comparing her to a "mashed-up bag of meat with lipstick on it." During his show’s regular "Worst Person" segment, Olbermann attacked Malkin for her role in bringing attention to the recent controversy over school children in New Jersey singing a song about President Obama. But we believe in God, a higher power. And the guns is, is really our freedom of choice. Like you said, the Second Amendment. But we should be able to do what the Second Amendment says. And we should be able to have the right to own and protect our own in our home because if somebody breaks in your home at 3:45 in the morning, they're not there to have coffee with you. That's for sure. We were out in California and we were watching the news, and superintendent arrested for kids praying in school. Hey, when we were kids, we said the Pledge of Allegiance because we were proud of this country, and we said prayer. You know, we thanked the good Lord above. On Friday’s The O’Reilly Factor on FNC, as host Bill O’Reilly and Fox News Sunday host Chris Wallace discussed recent comedy directed at President Obama and the First Lady – including a re-dubbed clip of Sesame Street’s Big Bird grilling Michelle Obama from the Tonight Show with Conan O’Brien – Wallace opined that he hopes that there would be more such comedy and that the Obama’s should be treated by comedians like "regular public figures and not as something heaven sent." He also lambasted the "idiocy" he saw on CNN as the Situation Room recently fact-checked a Saturday Night Live skit that took jabs at President Obama. 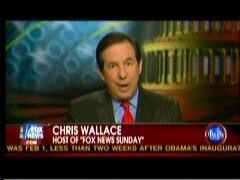 Wallace: "I mean, here, the idiocy of CNN doing a fact check on Saturday Night Live's send up of Barack Obama, the fact is that is what comedians should do. They should make fun of the people in power." Later in the show, O’Reilly brought aboard FNC’s Greg Gutfeld -- host of Redeye -- and Juliet Huddy to talk about the "dumbest things of the week," and Gutfeld presented his choice of the CNN fact-check, pointing out CNN’s double standard in its treatment of conservatives: "But they never did this when Will Ferrell went out and did Bush or when Tina Fey did Palin. They never analyzed when Republicans were parodied, but somehow when Barack Obama is parodied, they're shocked. They're incredulous. It's amazing to me." On Monday's Special Report with Bret Baier on FNC, correspondent James Rosen filed a report describing the line of obstacles to acquiring a handgun legally in Washington, D.C., in spite of last year's Supreme Court ruling overturning the city's outright ban on handgun possession in the city. Host Baier introduced the report: "Correspondent James Rosen reports while it is now legal to get a handgun in the nation's capital, it is definitely not easy." Rosen went through the steps of obtaining a gun during the report, and ended up playing a clip of NRA Executive Director Wayne LaPierre as he summed up the process. LaPierre: "What D.C. is doing is throwing up every obstacle, shackling the freedom to the point where it's no longer really a freedom." Former President Carter's recent claim that he never portrayed most tea party participants protesting against President Obama as being motivated by racism has been highlighted both on Friday's Special Report with Bret Baier and on Monday's The O'Reilly Factor on FNC. As previously noted by NewsBuster Matt Balan, the Thursday, October 1, American Morning on CNN showed a clip of Carter denying what he previously seemed to suggest in an interview with correspondent Candy Crowley. Carter's original accusations of racism by conservatives were reported by NBC and CBS, but those networks have ignored Carter's attempt to backtrack. On Friday's "Political Grapevine" segment on FNC's Special Report, host Baier relayed to viewers: "Former President Jimmy Carter is walking back from comments he made last month about President Obama and racism. Thursday, Mr. Carter said he did not mean protesters were upset at the reality of a black President." After reading Carter's denial, Baier then played Carter's original words: "I think an overwhelming portion of the intensely demonstrated animosity towards President Barack Obama is based on the fact that he is a black man, that he is African-American." When a group of about 200 doctors gathered in D.C. on Thursday, October 1, to demonstrate against the public option and in favor of tort reform and free market-based solutions, FNC’s Hannity show highlighted the group’s activities, as host Sean Hannity introduced a story by correspondent Ainsley Earhardt on how "doctors from around the country converged on Washington, D.C. today to protest the President's plan to overhaul health care." David Asman and Liz Claman of Fox Business Network even interviewed one participant in the rally – known as the Million Med March – on the same day. On FBN, Dr. Todd Rubin conveyed his fears that a public option would lead to a single-payer system. Rubin: "Eventually, if the bills that are currently presented pass as is written, what will we be left with will be a single-payer-dominated health insurer, and that will be the federal government." Video of the interview can be found here. When the White House staged a photo-op on Monday with 150 doctors who support ObamaCare, ABC’s World News anchor Charles Gibson touted the event later that day. Gibson: "The doctors were in the house – 150 of them in the White House today, all in white lab coats. 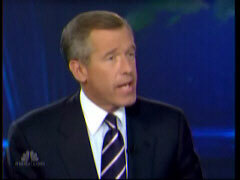 It was a show of support for President Obama’s efforts at health care reform." And NBC Nightly News anchor Brian Williams got to the story on Tuesday as he defended President Obama from charges that it was the White House that supplied lab coats for the doctors to wear for the photo-op. Williams: "Today's New York Post took issue with a photo from yesterday of a White House staffer passing out lab coats. The White House was accused of staging the photo op. Turns out the doctors group provided the extra lab coats for anyone who forgot to bring one along." On Friday's Special Report with Bret Baier, FNC correspondent Molly Henneberg filed a report relaying to viewers that a recently released Pew poll finds a continuing trend of pro-life sentiment gaining ground in public opinion in America. Last May, a Gallup poll showed a similar pro-life trend. After Baier introduced her report by observing that "popular support for abortion rights is on the decline," Henneberg began by relaying that, according to the poll, "fewer Americans than last year are comfortable with the idea of legal abortions in all or most cases." 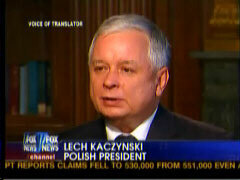 On Thursday, FNC viewers got to learn of a little known diplomatic faux pas on the part of President Obama, as the administration announced on the 70th anniversary of the Soviet invasion of Poland that America would back out of the plan for a missile defense shield previously worked out with Polish President Lech Kaczynski. On Special Report with Bret Baier, host Baier showed an interview with the Polish president who did not seem happy with President Obama’s foreign policy decisions. I thought that the August 2008 deal, I considered that to be a success. I worked very hard to bring about the deal, to make it successful. I would like to be honest with you, and I will just say that I did everything I could to just finalize the deal. I cannot say I was happy. It was a very important deal for us. 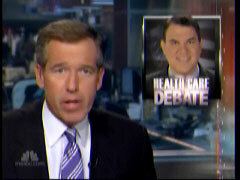 Uniquely among the broadcast network evening newscasts, NBC Nightly News anchor Brian Williams gave attention to "incendiary" comments made by Democratic Congressman Alan Grayson of Florida, who charged that the Republican plan for health care is that people should "die quickly" if they get sick, prompting Republicans to demand an apology. Williams seemed to signal his own disapproval of Grayson’s words as the NBC anchor introduced the item by remarking that "there’s something about this health care debate that makes some people say the most incendiary things." After playing a clip of Grayson’s comments, Williams informed viewers that the Democratic Congressman not only refused to apologize but "compared America’s health care situation to the Holocaust." If a regular fan of MSNBC primetime were to chime into a water cooler conversation with the words, "Terror plot? I haven't heard of any terror plot?" such an MSNBC devotee couldn't be blamed for not knowing about one of the big news stories of the past two weeks. While the arrest of terror suspect Najibullah Zazi -- who admitted to training with al-Qaeda in Pakistan and is believed to have been planning to target New York City -- featured prominently on every broadcast network evening newscast in the past couple of weeks as well as some evening shows on CNN and FNC, there was barely a mention during MSNBC's primetime schedule of the terror plot described by NBC Nightly news anchor Brian Williams as "one of the more serious terror plots since 9/11." We’ve seen this kind of a circus atmosphere here inside the U.N. ... And, Chuck, for a while, it did look like the bar scene in Star Wars, except that the stakes are so high. 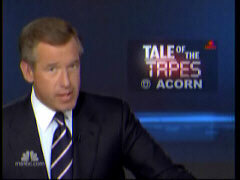 On Wednesday’s NBC Nightly News, correspondent Mara Schiavocampo filed a report based on her interview with video producer James O’Keefe, famous for his recently released video clips which exposed the willingness by a significant number of ACORN employees to give advice on breaking the law to O’Keefe, who posed as a pimp, and his friend Hannah Giles, who posed as an underage prostitute. Mr. President, with all due respect, we pray that you will read our letter and look at our dilemma. We don't want you to give us a loan. We didn't do anything wrong. We did everything right. We grew more food than anybody else with less water. And for that, our reward was you cut the water off. Come on, what's up?